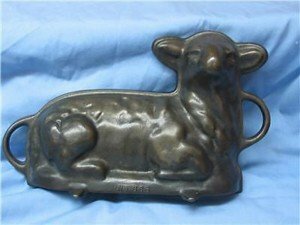 Is it possible to use an old fashioned cast iron Griswold lamb or bunny mold to make molded chocolates? If so, any tips or recommendations? Hello, I am working on using cast iron to make chocolate molds. I should have a test run done with a corn on the cob mold soon. When I am done I'll be sure to explain the method that worked for me and show photos. Thanks for that info. on using a gingerbread shaped cast iron mold for making chocolate. I look forward to hearing your further updates (and seeing photos when they are ready). I wonder if vegetable oil would leave less of a residue? I was testing out a gingerbread cast iron mold that was meant for gingerbread cookie recipe and decided to use chocolate instead. Well I didn't think it was possible. However, it can be done and I will try to upload a picture when I do a second run. First you have to brush it with shortening, using a cooking spray may work I did not try this method yet. Then after I've tempered the chocolate I poured it into the mold. Refrigerate to harden the chocolate. Then I ran a knife along the outside edges and the chocolate started to release. I gently tapped it out and left aside to dry. The only problem is the shortening left a residue. I'm still experimenting to see which method will works. How About Being Our Test Pilot? I guess the hardest thing may be removing the chocolate from the mold. I think that can be remedied (if it becomes a problem) by popping the whole thing into the freezer for a little bit. That should cause the chocolate to release itself from the mold. Well, give it a try and let us know how they turn out or any difficulties you have. You can be the test pilot for us! If you are able, take a photo of your finished product and send it to me. I'll add it here for others to be inspired.